Bradley N. Reames et al. As a result, the authors found that more than 30% of respondents initially motivated to travel to a top-ranked cancer center could be ‘demotivated’ to instead prefer a local hospital, if an affiliation were present. These findings have important implications for patient outcomes in the current healthcare environment. Recent work by Sheetz et al.10 indicates that hospital network participation is not associated with improvements in out- comes for patients undergoing four common surgical procedures (colectomy, abdominal aortic aneurysm repair, coronary artery bypass grafting, and total hip replacement), even when the amount of time in-network is considered. Previous work has suggested that hospital networks may improve cancer care through appropriate integration of services, including sharing of expertise for decision mak- ing, as well as selective referral of complex cancer patients to the corresponding high-volume tertiary referral centers. The results of the study by Chiu et al. suggest that complex cancer patients who choose to seek care at an affiliated local hospital may unknowingly forgo the benefits of specialized care at a regional referral center, particularly if established processes for integrated care are not followed. A patient with locally advanced pancreatic cancer receiving neoadjuvant therapy, for example, may unknowingly forgo a chance at exploration and resection if he/she pursues a surgical recommendation at an affiliated local hospital not experienced in the preoperative evaluation and perioperative care of combined pancreas and vascular resections, even if the hospital is considered ‘high volume’ for pancreatectomy (>20 annually).14 Similarly, recent studies have suggested that some patients with early- stage breast cancer may be subjected to an unnecessary axillary lymph node dissection, despite good evidence against its use, when receiving care from low-volume breast surgeons. Is the standardization of care and dissemination of best practices improved by regional network formation? Finally, if a significant impact on outcomes is identified, is it distributed equally throughout the network, or are subsets of patients (such as complex cancer patients) affected differently? These are critically important questions, and we applaud Dr. Chiu et al. for conducting an innovative study that begins to advance our understanding of the complex influence of regional hospital networks on modern healthcare. Introduction. Leading cancer hospitals have increasingly shared their ‘brand’ with smaller hospitals through affiliations. Because each brand evokes a distinct reputation for the care provided, ‘brand-sharing’ has the potential to impact the public’s ability to differentiate the safety and quality within hospital networks. The general public was surveyed to determine the perceived similarities and differences in the safety and quality of complex cancer surgery performed at top cancer hospitals and their smaller affiliate hospitals. Conclusions. 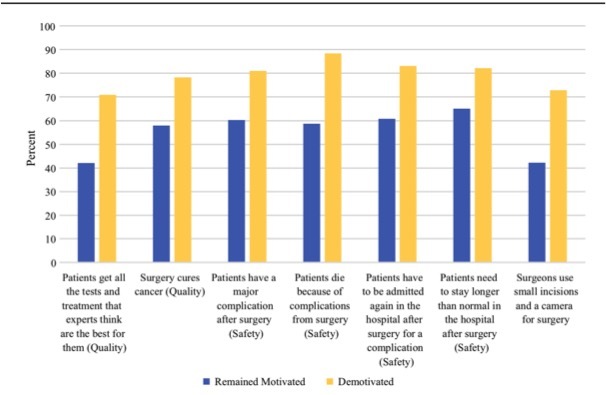 Approximately half of surveyed Americans did not distinguish the quality and safety of surgical care at top-ranked cancer hospitals from their smaller affiliates, potentially decreasing their motivation to travel to top centers for complex surgical care. Alexander S. Chiu et al. Results. A total of 1010 surveys were completed (58.1% response rate). Overall, 85% of respondents felt ‘motivated’ to travel an hour for complex surgery at a larger hospital specializing in cancer, over a smaller local hospital. However, if the smaller hospital was affiliated with a top-ranked cancer hospital, 31% of the motivated respondents changed their preference to the smaller hospital. When asked to compare leading cancer hospitals and their smaller affiliates, 47% of respondents felt that surgical safety, 66% felt guideline compliance, and 53% felt cure rates would be the same at both hospitals. The quality and safety of cancer care varies considerably from hospital to hospital. As a result, a patient’s choice of hospital for cancer care is a major determinate of their outcome. Complex cancer surgery is particularly prone to outcome variability across hospitals, and the risk of dying after an operation can be up to four times greater at hospitals that perform procedures infrequently. Therefore, the factors that influence patient choice for hospitals not only have the potential to influence the economics of cancer care but they may also influence survivorship. When asked to consider the safety of complex cancer surgery at a top-ranked hospital compared with one of their smaller, affiliated hospitals, 67.5% of respondents believed the rate of complications would be the same, 68.3% thought the readmission rate would be the same, 70.7% believed they would have the same length of stay, and 69.3% believed they would have the same postoperative mortality rate. Of those who identified a safety difference, the vast majority believed the larger, top-ranked hospital was superior. Overall, 46.8% of respondents believed that the surgical care at a top-ranked hospital and its affiliates would be the same across all four safety outcomes presented. When given the option between a smaller hospital without affiliations and a larger, top-ranked cancer hospital 1 h further away, 84.7% (n = 859) of respondents were ‘motivated’ to travel to a top-ranked hospital for complex surgical care. However, when given the option of a smaller local hospital that was affiliated with the top-ranked hospital, 31.4% of respondents (n = 273) who were originally motivated to travel, changed their preference in favor of being cared for at the smaller, local hospital. These respondents appeared to have been ‘demotivated’ to travel as a result of the affiliation. In general, those who were demotivated were significantly more likely to believe the quality and safety at the affiliated hospital as equivalent to the top hospital compared with those who remained motivated. All too often, people ignore my advice by saying that “our industry is different, and what you have to teach me doesn’t hold true for us.” Let me assure you, however, that our industries are not so very different, and that we both share a primary goal of serving the customer. Your department may be composed of some of the best physicians in the world, and you may know more about medicine than some of your competitors, but that doesn’t necessarily matter. 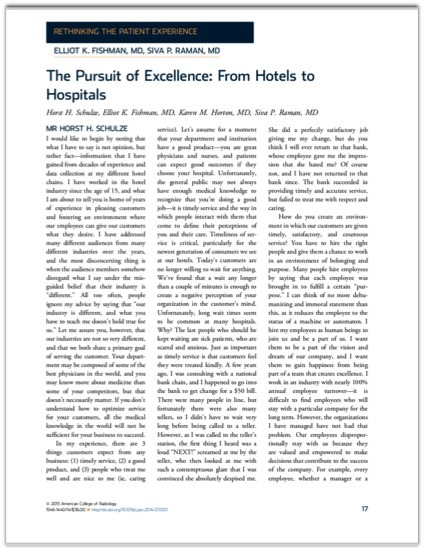 The pursuit of excellence: from hotels to hospitals. Schulze HH, Fishman EK, Horton KM, Raman SP. We’ve found that a wait any longer than a couple of minutes is enough to create a negative perception of your organization in the customer’s mind. Unfortunately, long wait times seem to be common at many hospitals. Why? The last people who should be kept waiting are sick patients, who are scared and anxious. Health literacy and online educational resources: an opportunity to educate patients. Hansberry DR, Agarwal N, Baker SR.
AJR Am J Roentgenol. 2015 Jan;204(1):111-6. A critical review of the readability of online patient education resources from RadiologyInfo.Org. AJR Am J Roentgenol. 2014 Mar;202(3):566-75. Are we effectively informing patients? A quantitative analysis of on-line patient education resources from the american society of neuroradiology. Critical review of patient education materials from the American Academy of Orthopaedic Surgeons. Feghhi DP, Agarwal N, Hansberry DR, Berberian WS, Sabharwal S.Am J Orthop. 2014 Aug;43(8):E168-74. Structured Reporting of Multiphasic CT for Pancreatic Cancer: Potential Effect on Staging and Surgical Planning. Lack of security of networked medical equipment in radiology. Introduction to rethinking the patient experience. Shellfish allergy and relation to iodinated contrast media: United Kingdom survey.